For optimal temperature control inside the house, it is desirable to design a house with as few air leaks in the home as possible. However, interior air quality can suffer because no air is going in or out of the home. Indoor air pollution can be caused by exhaust from appliances, dust, and animal dander. Energy Recovery Ventilators (ERVs) were designed to relieve this problem by filtering out contaminants in the air and removing stagnant air from the home. These systems also preserve air temperature during this process to reduce energy needs. 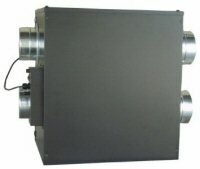 ERVs operate by exchanging stale, interior air for fresh, outdoor air. In the process, ERVs use a heat exchanger to make the incoming outdoor air have the same temperature and humidity as the outgoing air from the home. This exchange process is 95% efficient. In the winter, the ERV transfers some of the moisture from the exhaust air to the less humid incoming winter air, keeping humidity levels stable. During the humid summer, this process is reversed. ERVs are installed in line with a home's normal heating and air conditioning system, and can be placed at any location in the system. Fresh air intakes and an exhaust must also be installed in the home's exterior, and are usually 6 to 8 inch round openings. ERVs use very little energy because their only moving parts are a fan that moves the air across the heat exchanger. The 2005 Maryland house will feature a Stirling Technologies UltimateAir RecoupAerator 200DX ERV. This unit is the most energy-efficient and best-performing ERV available on the market. To learn more, please visit www.ultimateair.com. More information on ERVs, please visit The Home Ventilating Institute (HVI) website at www.hvi.org. HVI is the non-profit association that represented the manufacturers of home ventilating products. This organization offers a wide variety of services, including standardized tests for currently marketed ERV units, furnaces, and air conditioners.